where golfers, sports fans and gamers collide… nicely. The rules for playing in the EuroMillions are very simple and straightforward. The player has to choose five numbers from the range between 1 and 50 as their main numbers. Then they select two additional numbers from the range 1 and 11 as Lucky Star numbers. Ticket sales close on the day of the drawing, at 20:30 Central European Time, equivalent to 19:30 Greenwich Mean Time. The players of the EuroMillions should be aware of some important points. Only adult people are legally able to play in the EuroMillions: 18 or more years old in continental European countries, and 16 or more years old within the United Kingdom. 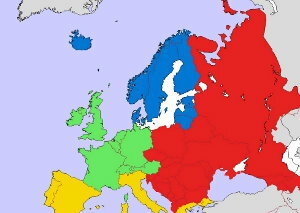 Note that each European country has its own specific deadline for claiming the prizes. In Austria, the winners of the EuroMillions have three full years to claim their money. In Switzerland and the United Kingdom, the prizes must be claimed within 180 days. In Belgium, the prizes have to be claimed in 140 days. In Ireland, Portugal and Spain, the winners must claim their prizes until 90 days after the drawing. In France and Luxembourg, the prizes have to be claimed within 60 days following the drawing. The odds are pretty tough for this popular game though (probably somewhere around the odds of getting a couple of holes in one on the same round of golf), so lottery syndicates are commonly used as a tool to boost up your chances. Good luck if you give this European marvel a shot. Right, back to the golf course. ← Just Why is Golf So Popular?